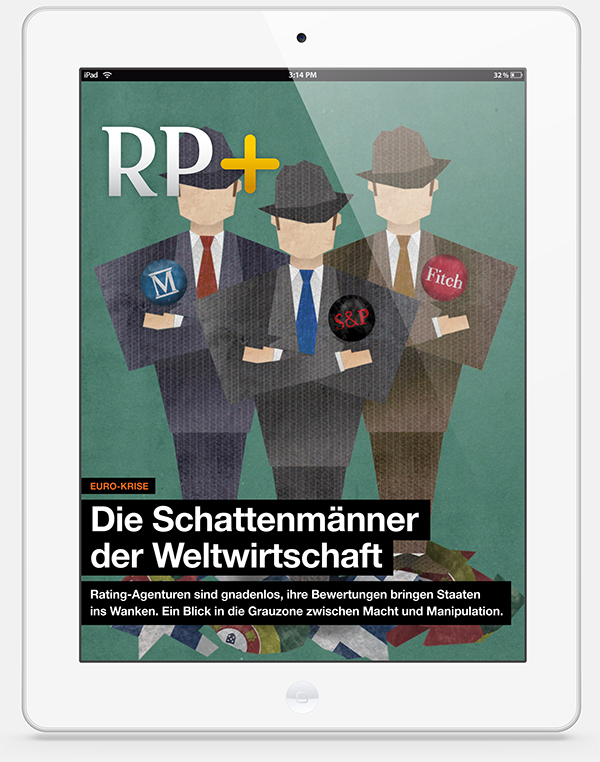 I worked with newspaper editors and programmers to conceptualize and design the layout, functions and logo of RP Plus, a weekly digital magazine published by the Rheinische Post featuring original content, rather than repurposed newspaper stories. Comic-style illustration for a story about the accusation that the (then) German Minister of Defense, Karl-Theodor zu Guttenberg, extensively plagiarized his doctoral thesis, which was later proven true. "Strg" is the German "Control" key. Published February 2011. Illustration for an article about the power and mystery of the main credit rating agencies, as the economies of a few European nations were threatened by downgrades. Published July 2011. Illustration for a story about the daily struggles of a driver in Germany, with record prices and uncertainty around biofuel. Published April 2011. Illustration for the issue after Osama bin Laden's death. Published before the similar May 16, 2011, New Yorker cover! Published May 7, 2011. Illustration for a story about Google's octopus-like takeover of the digital world after its acquisition of Motorola Mobility. Published August 2011.